Photo above: Law enforcement was heavily represented at the first meeting of the Public Safety and Policing Workgroup Monday. Lawmakers charged with making policy recommendations following the police custody death of Baltimore resident Freddie Gray peppered state officials responsible for police hiring and training standards with questions about racial diversity at their first work session Monday. “Obviously we’re missing something in the racial and ethnic diversity training on top of the excessive force training,” remarked Sen. Joan Carter Conway, D, Baltimore City. What is the diversity of police department training staffs? legislators asked. How often are psychological evaluations performed on police officers? What is the composition of the Police Training Commission? Senate Majority Leader Catherine Pugh, co-chair of the Public Safety and Policing Workgroup, concluded that diversity training, psychological evaluations for police officers, and a need for standardized police training would be among the work group’s top priorities. Senate President Mike Miller and House Speaker Michael Busch formed the Public Safety and Policing work group following the disturbances and state of emergency in Baltimore after the death of Freddie Gray. Gray suffered severe spinal cord injuries while in police custody and died shortly after in the hospital. City legislators had charged that legislation designed to control bad policing and police officers had been killed in committee. The workgroup is supposed to make recommendations for legislation in the 2016 session. Michael Zeigler, executive director of the Maryland Police and Correctional Training Commissions, defended the state saying that while standards are set by the commission, individual police departments have a lot of latitude for training police officers tailored to the jurisdiction they are working in. Zeigler also told the panel that the commission was in the process of developing a police training program known as “implicit bias.” The program would be designed to help police officers identify their own subconscious racial biases. Lawmakers also asked for data on the number of residents per police officer, which communities were most in need of police services, if police officers primarily live in the communities they serve, and why there was no central data source on officers who have been charged for crimes. “What happens when an officer goes from one police department to another?” Sen. Nathaniel McFadden, D, Baltimore City, wondered. Senate Republican Leader J. B. Jennings, Baltimore-Harford counties, asked who oversees the police departments to ensure they are complying by the standards set by the commission. Why not more black officers? McFadden also asked why there weren’t more black police officers to reflect the numbers of blacks in the population. Blacks in Maryland make up 29% of the state population, but only 14% of state police officers, according to data presented at the work session. The same gap was seen across the counties. Baltimore County has a black population of 26%, and 13% of its police force is black; Prince George’s County has a black population of 63%, and 43% of its police force is black; and, Baltimore City has a black population of 63%, and 39% of its police force is black. 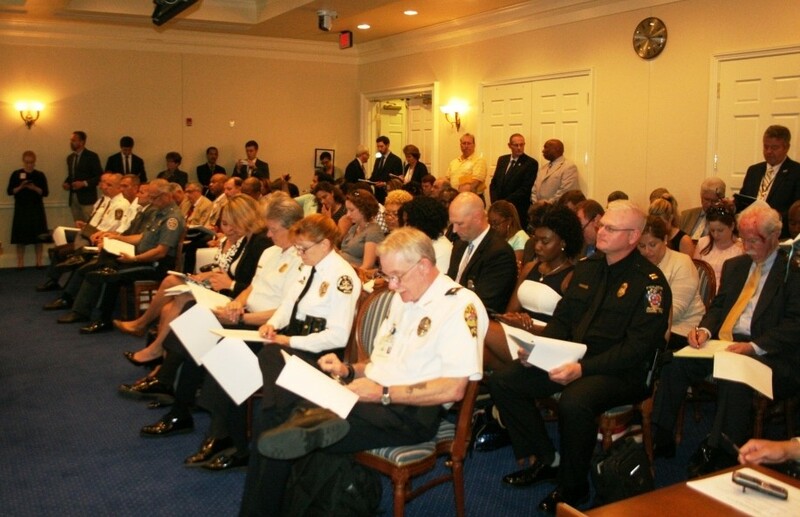 The workforce group will meet next on June 23 at 1 p.m. in Annapolis, where recruitment and hiring practices for law enforcement will be discussed.